The crystal clear water from the springs surrounding Rome (and other cities) was used for irrigation, public baths, fountains and to flush away excrements in the similarly impressive Cloaca maxima, the roman sewer system. In some places the water was constantly running. In others it was stored in massive cisterns, such as the Piscina Mirabilis, still largely intact today, and able to store 126,000 m³ of water. The surveying and engineering required to build this water supply system (almost 2000 years ago) was incredible. Some aqueducts like the Pont du Gard have a drop of only 0.0003 % or 17 cm per km over its entire length. These sophisticated systems required constant maintenance to remove blockages by fallen rocks, intruded roots or calcifications. Maintenance was conducted by the honorable “Aquarius”, the water engineer. They spanned valleys with bridges and siphons (made from lead), ran underground (like the Aqua Augusta) or on contour to minimise erosion. Such sophisticated infrastructure was of course vulnerable to attack. When the various barbarian tribes attacked Rome during the Fall of the Western Empire, the aqueducts were damaged to interrupt the cities’ supplies. After that, Rome could be taken by starvation in 410 AD by Alaric I. The first time the city had been sacked in 800 years and a major shock to contemporaries. 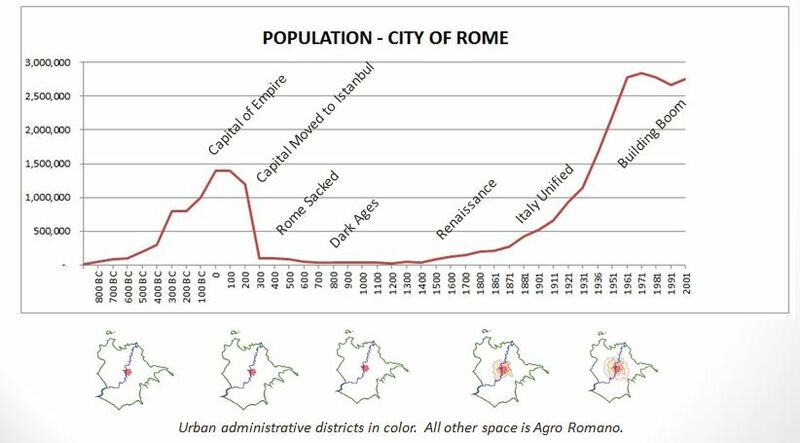 With constant barbarian incursions, internal quabbling and lack of public stability, the water supply system fell into disrepair and Rome’s population dropped to around 20,000 (the population numbers are of course estimates). Some early popes partially restored some of the aqueducts thereafter, but at around 800 AD they were practically not used anymore. The last aqueduct built in Rome was the Aqua Alexandrina in 226 AD. Then there is a 1200 year break until the Aqua Vergine Antica was restored under Pope Nicholas V in 1453 during the renaissance (building on the ancient Aqua Virgo, they dropped the Latin by that point…). The dark ages really were very dark. Our civilised life in big cities cleary depends on water. But, as the story of the Fall of the Western Roman Empire also impressively shows, water (supply) also depends on civilisation. Without the maintenance patrols to keep the aqueducts intact and organisational structure to keep them from being damaged, the Western Roman Empire succumbed to raging hordes of barbarians not to emerge until the Renaissance almost 1000 years of darkness later. Winter is coming! It’s easy to take our convenient supply of water and disposal of wastewater for granted, but it all relies on a fragile system of engineering, run by highly trained people with our tax money. Imagine all toilets are blocked for just a month in the place where you live. Things would be BAD. Now imagine that for a few years, decades and centuries. Not cool. Admittedly,a few bad situations came together for Rome to fall into decline. But many of these risks are still threats today. How about floods, droughts, failed harvests, storms or disease outbreaks? The only thing we are not threatened by are pillaging barbarians hordes from Germania at the moment. But who knows what 3 months without a toilet will do to people?! So make sure to pay your taxes and thank your plumbers next time you see them!